When my plate came, I looked upon it with fury. Someone had decided that a pickle would go nicely with a perfectly unvegan meal. This was terrible news, and had to remove the offending vegetable before proceeding with the eating. Luckily, the wrap looked like it was prepared according to my needs. I started eating and was pretty happy with what I tasted. 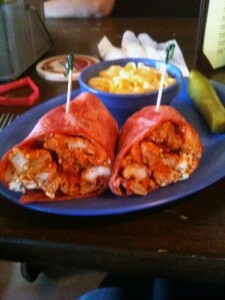 The wrap was definitely lacking in the aforementioned ranch sauce, but it still had a tasty buffalo sauce. The mac and cheese made a great side, but I was sad when I finished the thing about two bites. The Tavern on Main turned out to be a decent place to eat. The wrap was ultimately pretty generic, but they did generic pretty well.